Is lack of exits impacting Tiger Global's Indian appetite? From 2005, when it first set foot in India, till 2015, Tiger Global was roaring in the Indian startup jungle. The US-based asset management firm with hedge and venture capital funds made calculated moves in the first five years making two to five investments annually. In 2011, it took a massive leap and there was no stopping it from thereon. In 2015, for instance, it made 38 deals that included fresh bets on diverse startups such as Shopclues, Zostel, Grofers, Delhivery, Saavn, NewsInShorts, Vedantu and Little and large follow-on investments in its existing portfolio companies such as Flipkart, Ola, Quikr and Freshdesk. 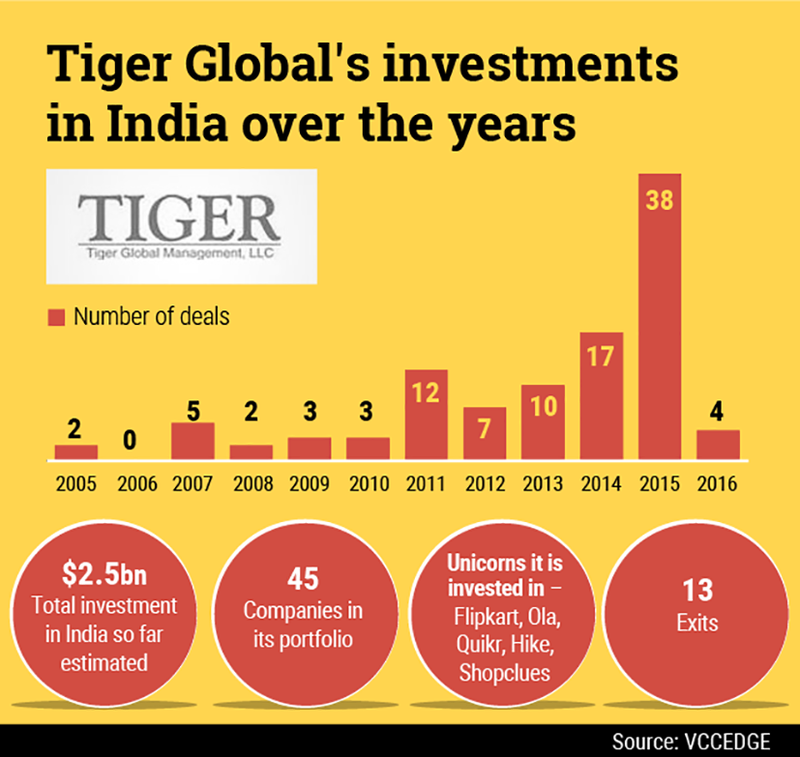 Tiger Global has emerged as arguably the largest institutional investor in consumer internet companies in the country investing around $1.3 billion in the past two years and close to $2.5 billion ever since it entered the market, reveals research from VCCEdge, the data platform of VCCircle. Overall, it has invested in 45 companies through 103 deals since 2005. Not too many investors, outside of venture capital firm Sequoia Capital or one of Japan's largest telecom company Softbank Group Corp, can boast this kind of a record in India. In keeping with the general slump in the investment scenario, 2016 has been a lackluster year for the hedge fund. It has made four follow-on investments totalling less than $100 million in companies that include Nestaway, Shopclues, Hike and Moneyview. But this is not what is worrisome. Past Imperfect When peers and industry leaders discuss Tiger's business in India these days, they do not speak of its hasty, and ambitious, bets in the past. Instead, they speak of its limited and poor exits so far. And, its need for a spectacular exit soon. And, the unlikelihood of it in the near future given the challenges most of the star companies in its portfolio are currently struggling with. VCCircle spoke with several of Tiger Global's peers as well as the companies it is invested in to discuss its investment strategy but most didn't respond and those who spoke pleaded anonymity given the sensitivity of the issue. A long questionnaire sent to Tiger Global went unanswered. Tiger Global has, so far, had three big exits. In its most recent exit from online jewellery company Caratlane, it exited almost on a par with the investment it made in the company over the years. The firm had made an early investment of $6 million in 2011, and by 2016, it had pumped in $52.22 million in the Caratlane picking almost 62% stake, show the data from VCCEdge. In July, Tiger Global sold off the entire stake to Titan, the Tata Group's watch and jewellery retailing firm, for a mere $53 million. In rupee terms, the hedge fund may have made a small gain but it was by no means an exit that will make any investor happy. Tiger is believed to have lost money with another early bet Babyoye, an online platform for baby products, which was sold to the diversified Mahindra group in 2015. The unimpressive exit was reflective of a harsh reality of the consumer internet business in India, which is -- that it is still a small market unlikely to grow too fast in the near future. Unlike expectations and predictions of fast growth from experts and market pundits, the internet traffic, and the number of customers making online transactions has yet to bear out the hype that has seen hordes of internet companies and investors make a beeline for the Indian market. Google's India head Rajan Anandan recently said leading internet companies in India might have a 10-year wait ahead of them to transform into mega businesses as addressable market is still small due to low purchasing power. Tiger, however, has had decent returns on investments in its early bets on online travel and hotel booking company MakeMyTrip (MMT) and JustDial, the digital business directory operator. Tiger continues to hold some stake in MMT. The online travel agency's valuation had fallen a couple of years ago to almost half of the $1.1 billion at the time of its Nasdaq listing in 2010, before climbing to around $800 million currently. In Justdial, Tiger had invested close to $23 million over two tranches beginning 2007. The eight-year-old investment offered nearly 18 times returns to Tiger by the time it exited in May 2015. Remarkably, both MMT and Justdial are listed companies and a large part of Tiger's returns on the two companies came from their public listing. Present Tense Currently, Tiger Global is invested in close to 30 companies. Of these, companies such as Flipkart, Ola, Quikr are market leaders in their respective segments. But their leadership is under serious threat from well-entrenched rivals such as Amazon, Uber and OLX, respectively. Having pledged an investment of $5 billion in India, Amazon, for instance, has claimed that it surpassed Flipkart as the most downloaded mobile app on Google and Apple stores in the first quarter of this year. Moreover, a report from technology and market research firm Forrester's Consumer Technographics Asia Pacific Online Benchmark Survey for 2016 said that the Indian business of the world's largest e-commerce company, had, for the first time since 2014, beaten Flipkart as the preferred online retail destination for consumers' in metropolitan areas. Also, Flipkart's valuation has been under pressure with half a dozen investors marking down the value of their stake in the company this year. Two of them recently marked up the value of their stake but its valuation still remains significantly lower than the last year's peak of $15.2 billion. Similarly, Ola's intense fight with Uber that spawned charges of unfair tactics, court room disputes and a nationalism debate has only got tougher with the latter's decision to focus more on India market after quitting China. The company recently said it would now use its resources to scale up India business. Outside of star companies in its portfolio, even the smaller companies aren't doing too well. For instance, early this year hyper-local delivery startup Grofers, a company in which Tiger made investments over four rounds in 2015, has shut operations in many cities. It recently laid off staff and revoked campus offers. Another investee company Zostel's distressed all-stock merger with its competitor Oyo is still not complete because of certain legal hurdles. Tiger quarterbacked the merger of property search and listing site Commonfloor with classifieds portal Quikr, a larger company it was already invested in. Future Indefinite Tiger Global is known in the investment community as a firm that doesn't make sporadic investments and instead, backs the companies it initially picks stakes in, to the hilt. "They (Tiger Global) make sure the companies' they invest in do not struggle for growth. They are not among those who will invest one tranche and then begin exploring exit," said a senior executive of a venture capital firm without wanting to be named. While it is true that Tiger Global has invested in most of the firms in its portfolio several times over, the fact also is that the firm has a reputation for trying to keep its investees on a leash. For instance, after Amazon began catching up with Flipkart on various scores in the e-commerce business, Tiger Global sent one of its managing directors Kalyan Krishnamurthy to Flipkart to manage its important functions such as category management. Even as Krishnamurthy reports to CEO Binny Bansal, he almost has a free rein and remains a Tiger Global representative in the company. Observers say in case of small startups with limited management bandwidth, this kind of control works better as it keeps the founders and employees on their toes but at the same time such a strategy can choke creativity and freedom and be counterproductive. For now, Tiger seems to have slowed its pace and adopt a wait and watch policy. According to a person familiar with its plans, the US hedge fund is unlikely to take any fresh bets in the "foreseeable future". "It has already put in a lot of money in India. It wants to see how its biggest bets â€“ Flipkart, Ola and Quikr â€“ perform in the next three years before becoming active again," the person said requesting anonymity. "Tiger is keen on a partial or full exit from at least one of these companies in the next three years," he added. Another person in a firm which has relations with Tiger Global said: "It (Tiger Global) has taken a strategic retreat and is waiting for valuations to further come down before becoming prolific again." High valuations, incidentally, may be a self-inflicted injury for the firm. A lot of people in the industry say that it were overenthusiastic investors such as Tiger Global that distorted valuations by pumping in millions in companies they backed.